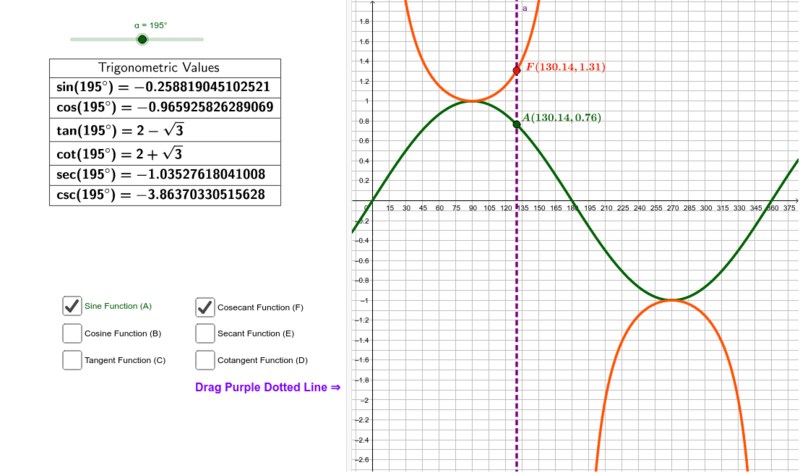 The chart gives the values of the trig value by 15° increments. One should learn the Unit Circle values which match 30°, 45°, 60°, 90°, 120°, 135°, 150°, 180°, 210°, 225°, 240°, 270°, 300°, 315°, 330°, 360°. You will notice a pattern. Table shows values to learn well, purple line can give intermediate coordinates. Check boxes select function to display. Reciprocal functions are beside each other.